Si Ma Cai district in Lao Cai is often called the twin sister of Sa Pa. Visiting a local market is a great way to explore the culture of Si Ma Cai. While Sa Pa is a well known tourism destination, its sister Si Ma Cai is a hidden beauty that still retains its serenity and originality. Si Ma Cai district sits in the northwest province of Lao Cai. It is about 95km from Lao Cai city, at the elevation of 1,600 metres above sea level. From Lao Cai city, one can take the bus to Si Ma Cai town. The curving road stretching from the city centre to Si Ma Cai is 95km. At some points it is quite steep. Arriving at Si Ma Cai, visitors can indulge in the pure nature, the mountains and thick forest as well as the fresh atmosphere. They can enjoy the beauty of the pink buckwheat flowers, mingle in the local market space and enjoy the local specialties. The area is surrounded by grand limestone mountain ranges. It is no longer a remote locality as there is a concrete road connecting the district with the neighbouring ones. From the Bac Ha plateau, one drives about 10km to get to Lu Than commune, where the pink buckwheat flower blooms on the hillsides in September. The blend of the green forest and pink violet flowers makes the area look like a painting. Si Ma Cai is also decorated with golden terraced rice fields in Sin Cheng commune, the grey rock garden in San Chai commune or the sea of clouds floating in mountains in Thao Chu Phin. The commune is also home to seemingly endless sa moc (evergreen coniferous trees) forest. A boat tour around the Chay river in Ban Me commune lets you contemplate the tranquil riverscape and valleys. Along with spectacular nature, Si Ma Cai also attracts visitors for its diverse culture formed by different ethnic minorities: Thu Lao, Mong, Tay, Nung. Each has their own costumes, cuisine and architecture. There are a number of options for one to explore the local life and ethnic culture, including the spring festivals and the markets of the Mong, Thu Lao and Nung ethnic groups. The Sin Cheng market takes place every Wednesday with the colourful booths displaying traditional costumes of the Mong ethnic people. There are several local markets worth visiting in Lao Cai: including Bac Ly, Ban Phiet and Coc Ly. 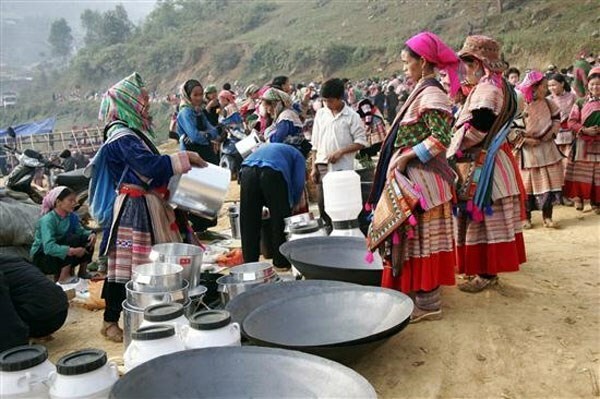 The best one is said to be Can Cau market, about ten kilometres from Bac Ha. The market opens every Saturday and on special occasions in the year. When the foggy dew still lingers in trees, local ethnic people with baskets on their backs head to the market, some leading their buffalo or horse, and some carrying a few chickens. Locals in the neighouring districts also gather for trading as this is known as one of the biggest horse and buffalo markets. Men buy horses and buffalo; kids snack in the eateries and women mostly gather in the clothes-selling areas. The market is separated into different areas: cattle, garments and food. Some Mong ethnic people wearing bright colourful clothes make the area look like a flower market. Specialty dishes of the region include maize wine, thang co (a dish made from horse meat and its organs), mountain pork, black chicken and Sin Cheng duck. The Quan Than San Mountain range at the height of 2,800 metres also impresses visitors along with the friendly smiles of locals.